USDA CERTIFIED ORGANIC: 100% certified organic herbal tea by OEFFA. All packages bear the USDA organic seal. The highest quality herbs available, farmed and packaged free from pesticides and herbicides. SOURCED FROM EGYPT: Our farmers work with us to make sure you receive only the best quality tea available. Our suppliers have numerous certifications (FDA registration, ISO 9001:2008, Organic certification) to prove you are getting an all-natural product. Nothing beats the fresh Hibiscus flowers from the fertile oases spanning the Nile. 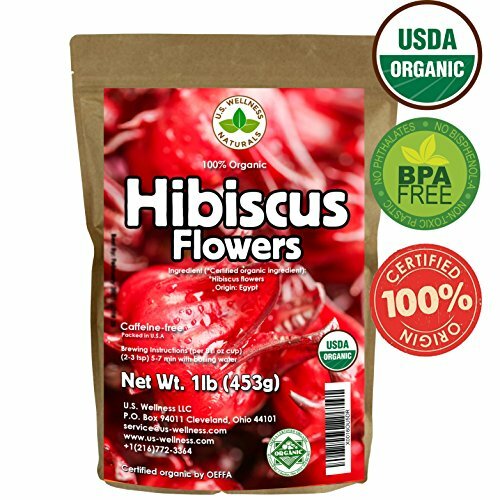 ESSENTIAL ELEMENTS IN YOUR TEA: Imported from farms in Lower Egypt, Hibiscus rosa-sirensis, is a popular drink going back many centuries. Also known as Roselle, the tea comes from the magenta colored calyces, flowers of the plant. Get that fresh, rejuvenated feeling you deserve. SHIPPING MADE EASY: The Hibiscus tea ships from our Cleveland, OH warehouse with an estimated arrival time of 2 to 5 business days. If you can't wait that long for the perfect cup, expedited shipping is also available. If you have any questions about this product by U.S. Wellness Naturals, contact us by completing and submitting the form below. If you are looking for a specif part number, please include it with your message.